The San Joaquin Electric Company was formed and the first earthen dam was built in Crane Valley in 1901. Mule-drawn freight wagons carried machinery and supplies up the mountain and went down loaded with timber that had been cleared from the reservoir site. Prior to 1991, The Pines Tract consisted of 255 undivided acres of land leased by Bud Williams (Williams Resort) from PG&E on a long term master lease which expired in 2013. The Land had been informally subdivided into 550 residential lots, some commercial property and the road network. Williams subleased these informally divided lots to persons who built cabins on the leased land. The Cabins were owned, but were built on leased land. The subleases were set to expire in 2012. because of this arrangement, the cabins were, for the most part, modist. As 2012 was getting closer, maintenance was deferred and very few cabins were remolded improved. It was very unclear that PG&E would grant Williams another master lease. It was equally unclear if Williams would be reasonable in renegotiating renewal of subleases. In 1984 Henry "Barney" Bernard formed the Bass Lake Homeowners Association. With a lot of hard work and help from the County of Madera, sublease owners were able to buy out the Williams Resort. A Bond assessment program was implemented in 1989, money was raised, and over it's objections, Williams Resort was bought out for $5.1 Million Dollars. Negotiations commenced with PG&E and again, after lengthy negotiations and bargaining, PG&E sold 125 Acres to the Bass Lake Homeowners Association for 16.3 Million Dollars. This took another bond issue to raise the money. Liens on every piece of property which went to the bond for financing were put in place. People started getting their deeds to their land in 1992. Again in this process, Madera County assisted in many ways, supporting the bond issue, serving as a facilitator, holding the land until it could be surveyed, officially subdivided and the deeds issued, etc. Since sublease holders became real property owners without the fear of loosing their investment, the community was reborn with a boom of new building. Old cabins were torn down and others remolded. Property values have soared with Lake Front homes selling for over $2 Million Dollars. For a few years in the 1920s, Bass Lake was served by a fully accredited, common carrier railroad for which the town of Wishon was established in 1923. Wishon was the mountain terminus of the Minarets and Western Railroad which extended 53 miles from western end of the Bass Lake Dam to Pinedale on the banks of the San Joaquin River just north of Fresno. Solely owned by the Sugar Pine Lumber Company, the railroad’s primary purpose was to carry logs to a huge mill at Pinedale, but it was an official common carrier. A privately owned, standard gauge railroad carried the logs from Central Camp across Bass Lake Dam to Wishon. The town was named for A. Emory Wishon, who was active in the early development of hydroelectric energy using Bass Lake water and who became executive vice president of Pacific Gas & Electric Company, after it purchased the Bass Lake operation. 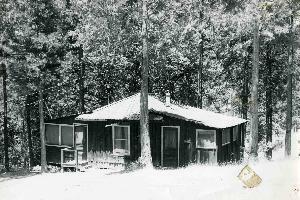 Although Sugar Pine Lumber Company failed after only eight years, the post office continued until 1986. During those years, it was housed in what today is called Miller’s Landing. The store had been started by John McDougald, who was Wishon’s first postmaster.Born a railroad town, for many years Wishon showed remnants of cars and other railroad material. Did you know that the Pacific Gas & Electric Company is one of the largest utilities in the United States? Are you aware of where the first powerhouse was located in the Central Sierra or how the site became part of the PG&E hydroelectric generation system? It all started in 1895 when J.S. Eastwood, civil engineer for the City of Fresno, and J.J. Seymour, formed the San Joaquin Light and Power Company. In 1896 they completed construction of a powerhouse on the San Joaquin River between Auberry and North Fork. This powerhouse (PH#1) was remarkable because it had head of 1410 feet (“head” is the drop from the top of the penstock to where it enters the power house) and transmitted power all the way to Fresno (37 miles), both engineering records at the time. Unfortunately, the Fresno Gas & Electric Company resented the new competition and filed claim to the riparian water rights in Crane Valley (Bass Lake) thereby interfering with the reliable flow of water to Power House #1, located by the San Joaquin River about halfway between North Fork and Auberry. This problem, coupled with several years of drought, forced this pioneering effort into bankruptcy in 1899. Both Eastwood and Seymour suffered heavy financial losses. The San Joaquin and Electric Company was placed in receivership with John Seymour appointed as receiver. John Eastwood was no longer in the picture. In an effort to establish a year-round water supply for San Joaquin #1, Seymour applied for a permit in 1902 and started construction of an earth dam at Crane Valley (now Bass Lake). You can imagine the surprise when Seymour (also President of Fresno Water Company) was arrested in his office by federal authorities. It seems the permit application had not been acted upon and Seymour had started construction prematurely. Seymour’s brother-in-law, J.M. Howells, obtained the option on the defaulted bonds for the San Joaquin Electric Company and together they traveled to Los Angeles to meet with W.G. Kerckhoff and A.C. Balch. Kerckhoff and Balch were major investors in hydroelectric power plants in Southern California and controlled almost half of the stock of Pacific Light & Power Company. They purchased the assets of San Joaquin Electric Company (San Joaquin Powerhouse #1, transmission line to Fresno, water rights, etc.) and formed the San Joaquin Power Company. They now owned San Joaquin #1, however they did not have a manager. Fortunately for Kerckhoff and Balch, Albert Graves Wishon approached them at that time about some water rights on the Tule River. A.G. Wishon already had experience building and managing two other small hydroelectric systems in the Kaweah and Tulare areas. Kerckhoff and Balch declined the Tule River opportunity but hired A.G. Wishon to manage their newly acquired power plant on the San Joaquin River. San Joaquin #1 was then operated successfully until 1910 when it was replaced by a larger and more modern plant now named A.G. Wishon Power House. Today, travelers can see this newer powerhouse near the upper end of Kerckhoff Reservoir on Power House Road. That does the new San Joaquin Power Company controlled by Kerckhoff and Balch and managed by A.G. Wishon have to do with the Pacific Gas and Electric Corporation? After bankruptcy, Los Angeles investors A.C. Balch and W.G. Kerckhoff acquired the company. They immediately hired A.G. Wishon as general manager. Thus, in 1902 the new company, San Joaquin Power Co. consisted of one powerhouse – San Joaquin #1, a small dam at Bass Lake, transmission lines to Fresno and Hanford, and a system of canals and flumes. A.G. Wishon set to work expanding the demand for electricity in the Central Valley and developing further sources of electrical power. Key to this expansion was an agreement between Pacific Gas & Electric Co. and San Joaquin Power Co. In this agreement a boundary was defined to establish their electrical service areas thereby permitting the San Joaquin Power Co. to expand into all of Central California. Over the next 20 years, the San Joaquin Power Co. (later becoming San Joaquin Light & Power) constructed four more power plants on Willow Creek above San Joaquin #1 was replaced by a more modern powerhouse, now named A.G. Wishon Powerhouse, and in 1920 the Kerckhoff reservoir and powerhouse were constructed. This later addition resulted in the first powerhouse and dam to use the waters of the San Joaquin River. In 1927 the Balch powerhouse on the North Fork of the Kings River was completed. All of these hydroelectric power plants are still in operation. By 1930 the San Joaquin Power Co. had reorganized as the San Joaquin Light & Power Corp. (to obtain more capital) and had purchased or merged with several other power companies. This resulted in eleven power plants supplying energy to a service area stretching from Bakersfield to Merced and from the mountains to the ocean. At this point, irrigation systems and oil fields were electrified and electricity was available to virtually all communities in Central California. A.G. Wishon had been joined earlier by his son A.E. Wishon and when W.G. Kerckhoff retired they together managed the San Joaquin Light & Power Corp. In 1936, a merger of San Joaquin Light & Power and Pacific Gas & Electric was completed, which significantly expanded the service territory of PG&E. A.E. Wishon served as a director and executive Vice President of PG&E until his untimely death in 1946. Today the legacy of these pioneers can be found in the powerhouses and reservoirs bearing their names and in the strength of Pacific Gas & Electric Corporation that has become one of the largest utilities in the United States. This enterprise all started in 1896 with the construction of Eastwood’s powerhouse, San Joaquin #1, between Auberry and North Fork.